With the football fever gripping the world, football lovers across the globe are not only catching the excitement on the television sets but also sharing their sentiments on social media platforms. The digital media has been buzzing with fans across age groups eagerly discussing the footballers, teams, performances, goals and key incidents of the match. TO THE NEW, Asia’s leading digital solutions network, has released a report that analyzes digital conversations across various social platforms such as Twitter, forums and news sites that took place from June 1- June 23, 2014. The report, powered by ThoughtBuzz, the social media analytics’ arm of the company, gives a comparative analysis of the social media buzz generated both globally and in India. The report that gives a demographic split of the netizens both in India and the world highlighted that globally the youth primarily below the age of 25 were the most active on social media contributing to 44% of the discussions while netizens between the age groups 25 and 40 contributed to 32% of the discussions. 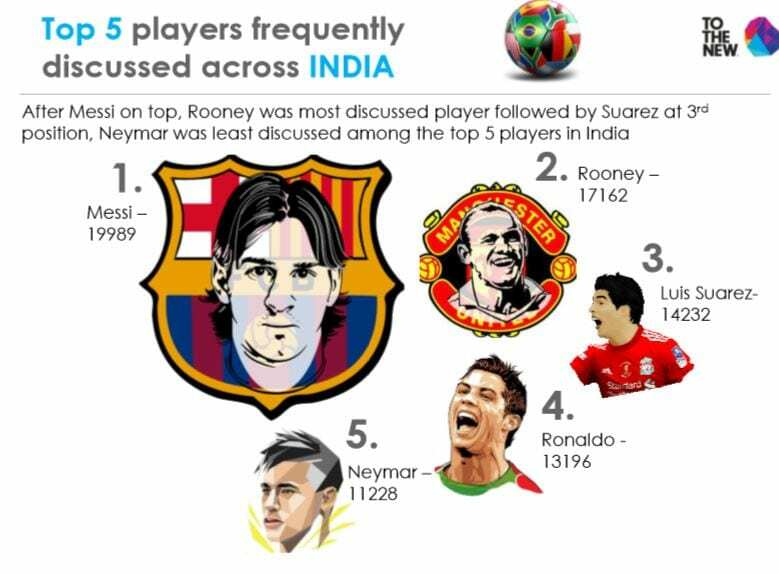 Netizens above 40 years were more interested in the players historical and match historical data contributing to just 19% of the discussions. Unlike their global counterparts, Indian football fans across age-groups were actively discussing about the Football World Cup. While the youth contributed to 36% of the discussions, netizens between the age groups 25 and 40 contributed to 41% of the discussions while the netizens above 40 years were actively discussing about the winners, team goals and matches contributing to 23% of the discussions. The report also highlights that women are gaining interest in the game and are also engaging in digital conversations this Football World Cup. Out of the total social media discussions on the Football World Cup globally, women contributed to 16% while men contributed 84% of the discussions. The Indian women weren’t far behind their global counterparts contributing to 11% of the discussions while men contributed to 89% of the discussion. Founded in 2010, TO THE NEW is Asia’s leading specialist in SMACK Services – Social, Mobile Analytics, Content and Knowledge and delivers integrated digital solutions to help clients connect with social and mobile first consumers and drive tangible business performance. TO THE NEW’s SMACK effect is backed by its ‘Centers of Excellence’ in Analytics led by ThoughtBuzz, Digital Marketing by Ignitee, Social, Local and Mobile by Techsailor, Content by Tangerine Digital and Technology by IntelliGrape.